The exhib it case at the east end of the Corridor features displays created by our museum interns each year. 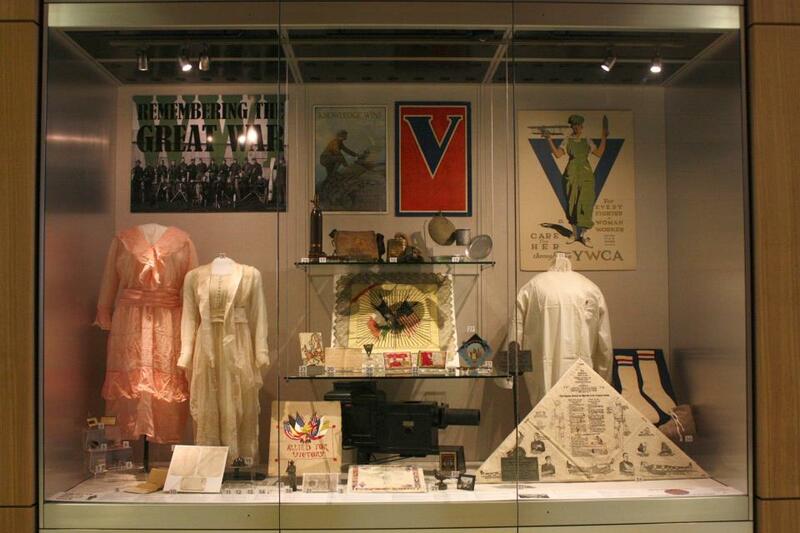 Objects from the Great War features a wedding dress, bag and gas mask, lantern slide and projector, posters, pins, identification tags, and more. 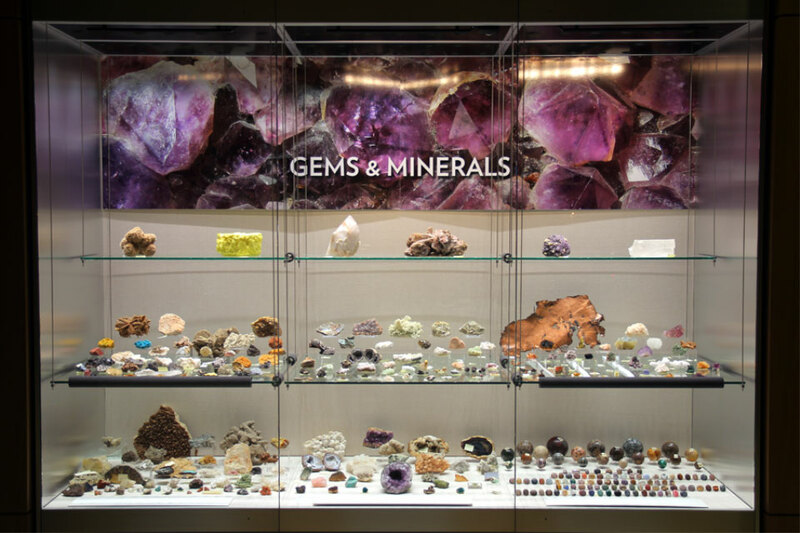 Located outside the Adaptation Gallery: Geologic Time is a gem and mineral exhibit of specimens from the North Dakota Geological Survey (NDGS) State Rock and Mineral Collection. View specimens from around the world, most from the donated Blossomae Campbell Collection. Lapidary spheres, cabochons (gemstones that have been shaped and polished), and other objects created from rocks and minerals were donated by Melvin Anderson, Jacob and Catherine Schlosser, and Bob Randall. See a florescent mineral exhibit with specimens donated by Ray and Russ Oliger in the Adaptation Gallery: Geologic Time. 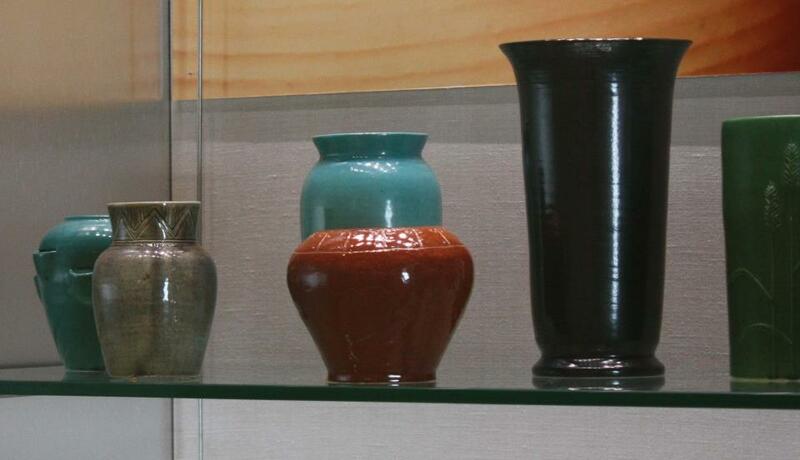 The Works Progress Administration (WPA) Ceramics display is located outside the Innovation Gallery: Early Peoples. President Franklin D. Roosevelt established the WPA during the Great Depression to generate jobs. Articles made in North Dakota were produced for state institutions and could not be sold. WPA workers created utensils for school hot lunch programs, nursery rhyme characters and animal figurines for nursery schools in the state, and decorative items such as bowls and vases. On exhibit are examples of decorative pieces, nursery rhyme figures, and school lunch pottery. A large collection from the State Historical Society’s gun vault highlights the evolution of firearms, from the earliest flintlock weapons of the 1700s to guns used in World War II. This exhibit is located at the west end of the Corridor of History, close to the Inspiration Gallery: Yesterday and Today.